It would appear that Americans don't have a monopoly on waste, over-indulgence and generally pointless pastimes. 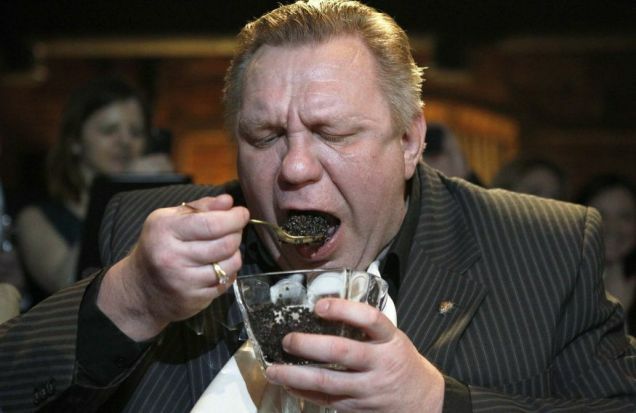 Last week in Russia, Mr. Alexander Valov won the caviar speed-eating crown in Moscow. He won it by eating half a kilogram (1 lb. 6 oz.) of black cavier in just one minute and 26 seconds. Hundreds of guests, many dressed in suits, attended the event at The Apartment Restaurant in Moscow where 12 contestants were picked to compete at random. Black caviar is salted, unfertilized sturgeon roe (unfertilized fish eggs). It is a highly sought delicacy in Russia. In terms of volume, Mr Valov's accomplishment is similar to the World Hot Dog eating champion (winner Joey Chestnut eats over 6 hot dogs per minute). However, this contest is more high-class and considerably more expensive. Mr. Valov's 1.5 minutes of glory cost around $6,000 (£3,000). The event organizers spent nearly $70,000 on caviar for the participants.